Now that the regular season has concluded, it is a good time to see how teams stack up in some less traditional statistical categories now that the league is in it’s second year of providing additional information. Using offensive and defensive rating is a good way of comparing teams because it equalized the number of possessions being accounted for with both expressed as points per 100 possessions. The blue bar represents offensive rating while the red bar represents defensive rating. The difference between the two is the net rating. The team win-loss records are pretty clear for this season after looking at this chart. 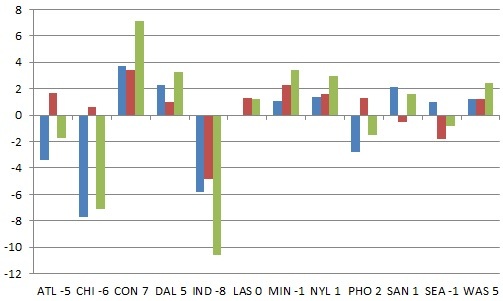 The four non-playoff teams all have substantially worse offenses than the playoff teams. The top four defenses had the best records in order while the three offenses were among those teams. Minnesota and Los Angeles continue to lead in both categories while New York continues to rely on a stingy defense to pick up wins. Dallas and Seattle were the last teams in the playoffs and their solid offenses were betrayed by below average defense. Atlanta’s defense was very solid, but their lack of offense stifled their attempts to sneak into the playoffs. San Antonio’s offense continues to lag behind the rest of the league as they finished at the bottom of the standings again. With two seasons of statistics, it is now much more simple to compare the two years. The blue column represents the change in offensive rating, the red column represents the change in defensive rating, and the green column represents the change in net rating from 2016 to 2017. The changes in wins is included in the team labels. Looking at the the teams with dramatic changes in fortune between the seasons, it is clear why the number of wins changed. Connecticut, Dallas, and Washington improved both defensively and offensively. Indiana’s collapse happened on both sides of the ball, while Chicago and Atlanta saw their decline occur on the defensive end. Minnesota and Los Angeles were viewed as having dominant regular seasons last year, and this year has seen both of them improve in on court performance, even though there was a negligible difference in their records. Separating the two rebound percentage statistics gives a better picture of team at each end of the court. 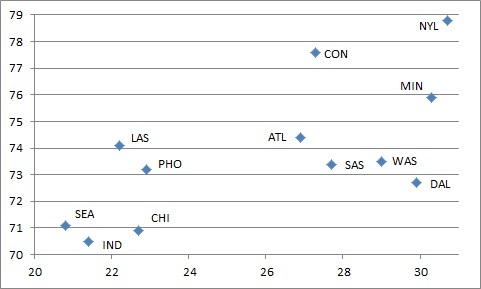 The x-axis represents the percentage of available offensive rebounds that the team grabs while the y-axis represents the percentage of available defensive rebounds that the team grabs. Since offensive rebounding is often the result of strategy decisions, measuring defensive rebounding on its own is useful. Strong defensive rebounding limits the opposition’s chances and gives the team more chances on offense. Strong offensive rebounding can give the team more chances, but if it is the result of sending more players to crash the board, could result in giving up more transition points. New York continues to be one of the league’s better rebounding teams, leading in both categories. Connecticut follows them on the defensive end while Minnesota is the next team on the offensive end while also being among the leaders on the defensive end. Indiana, Seattle, and Chicago struggle at both ends while the rest of the teams hover around the average defensively, but range widely at the offensive end. The top five defense rebounding teams also have the top five defense and include the four teams in the league with the best records. Offensive rebounding does not share the same relationship with offense. The first chart is a breakdown of how each team scores its points while the second chart show how each team gives up its points. The blue bars represent points from two pointers, the red bars show points from three pointers, and the green bars show the percentage of points coming from free throws. While some of the extremes from other seasons are not replicated in this seasons figures, there are still some interesting observations. Seattle scores a larger percentage of its points from behind the arc, but it also gives up the largest percentage from distance. Dallas scores the lowest percentage of its points from two point field goals, but a larger percentage of the points scored on them come from inside the arc than for any other team. Measuring correlation between various statistics can lead to rethinking of the relationships between them. It is difficult to determine whether or not these relationships exist, but R-Squared, which ranges from 0 to 1 can determine how strong that relationship is within the data that is available with higher numbers being stronger. The first chart shows correlations calculated with offensive rating and the second chart shows correlations calculated with defensive rating using team data. Unsurprisingly, teams with strong assist to turnover ratios at higher offensive ratings. Assists signify good offense while turnovers prevent more scoring opportunities, which is also shown by teams with higher turnover percentages having lower offensive ratings.. Teams with better defenses also tended to have better offenses, which is likely due to those teams having better personnel among other factors. What is interesting is that defensive rebounding percentage had a higher correlation than offensive rebounding percentage, although neither had a particularly large R-Squared. In theory, offensive rebounds should result in more chances to score, but this may represent different strategic choices. Defensive rebounding could indicate talent disparities, but less energy expended on defense could also boost offense. Pace and free throw rate have positive, but weak correlations. It is no surprise that defensive rebounding has a strong correlation with better defense. The ability to limit opponents to single chances on the offensive end is clearly useful. Offensive rebounding also had a correlation in the same direction, which could indicate that crashing the boards could help prevent the opposition from getting into their offense quickly. Block percentage and pace had correlations in direction that would be expected, with teams blocking more shots and teams that played in slower games having better defensive ratings, but neither correlation was particularly strong.